Starbucks is keeping it merry and bright this holiday season with fruitcake frappuccinos and ugly sweater cookies. Can Starbucks save the fruitcake? The coffee chain is breathing new life into the much-reviled holiday dessert, reinventing it tantalizing frappuccino this weekend. Much like a real fruitcake, the frappuccino contains a base of hazelnut creme, filled with candied fruit, nuts and spices. The frappuccino will be available through the weekend. Just in time for National Ugly Sweater Day on Friday, an ugly sweater cookie is also joining the ranks of Starbucks' seasonal offerings. 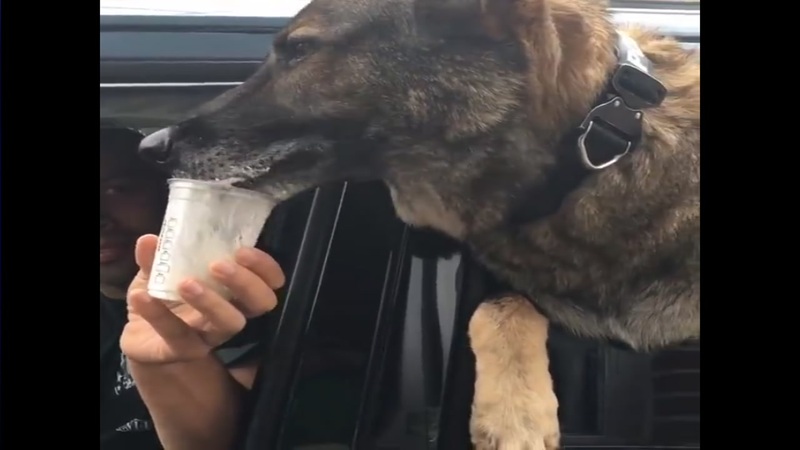 A police dog in Ohio is taking the internet by storm as he fervently feasts on a sweet treat in a Starbucks drive-through lane.